Cholesterol is a sterol that is essential for all animal life, being critical for membrane permeability and fluidity and for many cellular functions. 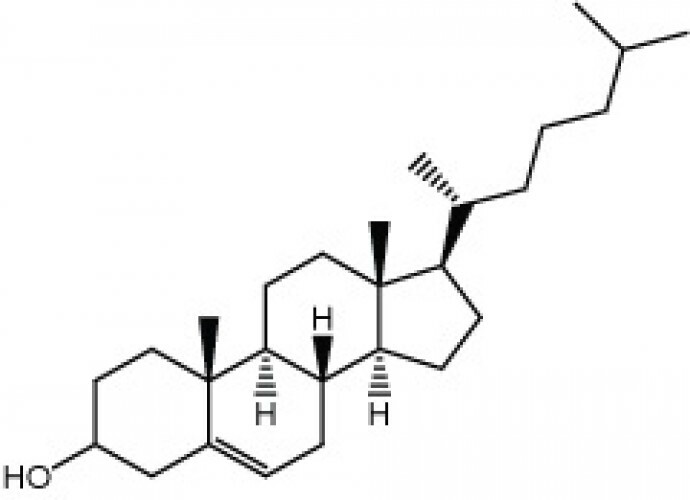 It is a sterol that is both synthesized in animals and also acquired from the diet. Phytosterols have been found to compete with cholesterol for absorption in the intestinal tract which results in a reduction of cholesterol absorption.1 Recently, the affect of Phytosterols on micellar cholesterol solubility in bile has been investigated demonstrating that stigmasterol combined with saturated fatty acids are effective at lowering cholesterol micelle solubility in vivo.4 Cholesterol has been found to be involved in the regulation of certain integral protein activities and in vascular function and it is the precursor of steroids, bile salts, and vitamin D. Cholesterol also has functions in intracellular transport, cellular signaling and nerve conduction.2 There has been evidence that demonstrates that there is a link between brain cholesterol and Alzheimer’s disease.3 A high level of serum cholesterol has been identified as an indicator for diseases such as heart disease. A recent study has found that cholesterol may affect the functions of Apolipoprotein C-III and Apolipoprotein E involved in the clearance of lipoprotein remnants.